In practice, its orbit is well determined thanks to 290 optical observations and 13 radar measurements, but there is a significant "orbital uncertainty" because, besides gravity, its path is influenced by the Yarkovsky effect. Such disturbance slightly modifies the orbits of the Solar System's small objects because, when rotating, they radiate from one side the radiation they take from the sun through the other side. The research, which has been published in Icarus journal, predicts what could happen in the upcoming years considering this effect. Up to 2060, divergence of the impacting orbits is moderate; between 2060 and 2080 it increases 4 orders of magnitude because the asteroid will approach the Earth in those years; then, it increases again on a slight basis until another approach in 2162, it then decreases, and 2182 is the most likely year for the collision. "The consequence of this complex dynamic is not just the likelihood of a comparatively large impact, but also that a realistic deflection procedure (path deviation) could only be made before the impact in 2080, and more easily, before 2060," stands out Sansaturio. The scientist concludes: "If this object had been discovered after 2080, the deflection would require a technology that is not currently available. Therefore, this example suggests that impact monitoring, which up to date does not cover more than 80 or 100 years, may need to encompass more than one century. Thus, the efforts to deviate this type of objects could be conducted with moderate resources, from a technological and financial point of view." I imagine we have a turret ring around the earth by that time, which will target asteroids like in starship troopers. How strange. Think about this: In the example above, let's pretend that the likelyhood of impact were much higher, like 1/10. We would have to do something at that point, so we spend billions of dollars and we successfully deflect this rock in 20 years. Our theoretical impact isn't 100% sure, just one in ten, but we moved it enough that it's no longer a danger. The people we saved aren't alive yet, and most of them won't even be born until long after we are all dead. That's 172 years from now. Would anyone even remember it except a historian, physicist or astronomer? When that year eventually comes, would they celebrate our efforts with a holiday or a TV mini-series? Just an idle thought to ponder. 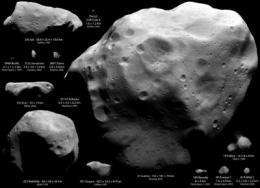 Good point that detecting/averting possible Earth-crossing asteroids is not only in our (short term) best interest but may save future generations yet unborn. "When that year eventually comes, would they celebrate our efforts with a holiday or a TV mini-series?" Reruns of 'Meteor', 'Armageddon', 'Deep Impact' with no commercial interruptions! This article is not new... This article is based in a paper of january 2009. The new is that they have estimated 'exactly' the possibility of impact. Why bother having an option for enlarging the photo/picture? It's all the same: unreadable! A back of the envelope calculation if it's density is 2g/cc and it hits at 5km/s the impact will equal 1 gigatonne which is about 10% of annual human energy needs in one year. It seems we're already giving ourselves slow impact damage 10 times worse each year though it happens continuously instead of in 10 short bursts. Even if it was a sure impact we still have until 2060 to decide how to change the orbit without penalty. And by that time we probably have found some much better way's of changing the orbit. Despite all the atrocities that happened, if it weren't for those happening, the world would be in one hell of a state. Sadly, those wars and the nuclear bombs led to stability for the most part. Whether or not this stability will last till that date is beyond me, but i would think not simply due to increasing numbers, dwindling space and resources. 172 years from now? School children will probably visit it to study near Earth objects first hand. We'll probably mine it and use it for our own benefit. If we haven't figured out how to stop it by then, we deserve the destruction it brings.